There are two pieces in the Guardian about a growing trend: people arguing that criticism is “silencing”. First up, Jack Bernhardt on comedy. we witnessed another great moment in comedy this week, when the BBC’s head of comedy asked the question we didn’t realise needed to be asked: is comedy dying because the internet is turning people into Victorians? …[such comments perpetuate] a culture war based on ignorance, allowing rightwing newspapers to paint a dystopian caricature of social media, where white men are oppressed with terrifying phrases like “check your privilege” and “identity politics”, and opinionated children burn effigies of John Cleese. Elsewhere in the paper, Dawn Foster takes historian Niall Ferguson to task for his persecution complex. I would pause, for at least a few seconds, if I found myself arguing that my freedom of speech was in a state of extreme jeopardy in this, my column in a national newspaper. Of all the tired tropes trotted out by the quick to whinge and slow to think, the “I’m being silenced” one in national, sometimes global media is one of the most tiresome. To hear handsomely paid, high profile media voices claim to be an oppressed minority would be laughable if it weren’t so serious. 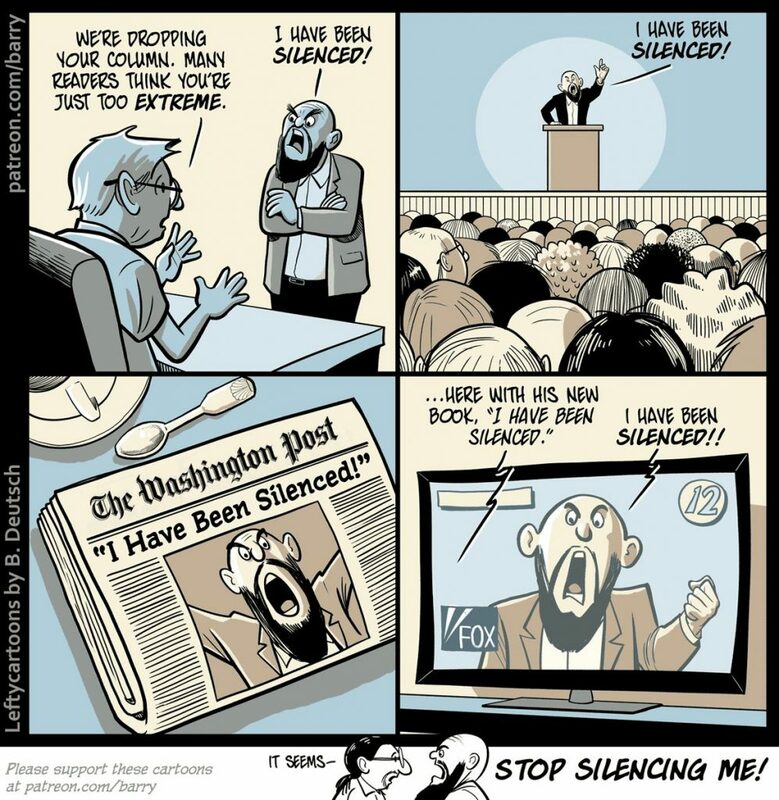 As ever, the problem isn’t that anybody is being silenced. It’s that powerful people are being criticised. You’d think academics such as Ferguson would know the difference between censorship and criticism. the Venn diagram of men arguing that freedom of speech is the central, precious tenet of “western civilisation”, and those who scream bloody murder the second they are subject to any criticism, or are forced to bear any responsibility for their speech, is a single perfect circle. Free speech does not occur without responsibility: to use the traditional metaphor, if you scream “Fire!” in a crowded theatre, you will be culpable when a stampede ensues. If your arguments are racist, sexist or homophobic, the people you attack will rightly point out your prejudice and query whether your professional position is compromised by holding such prejudices. This isn’t difficult. Freedom of speech means the government can’t put you in prison for having an opinion. What freedom of speech does not guarantee is freedom from criticism. Time for this cartoon again. This isn’t about censorship. It’s about ego and status preservation. People who are used to having their words taken as gospel are suddenly hearing people disagree with them, and they don’t like it. For years, privileged men have been able to frame themselves as agents provocateurs – often spouting the kind of opinions a roaring, angry drunk on the night bus might, but with a plummy accent, an Oxford degree, and an overreliance on antiquated vocabulary – in columns in national newspapers. Their fury is not that they have been silenced – they have not – but that their victims have argued back, and they have been forced to bear responsibility for their words.